As part of a prestigious traveling exhibit on still-life painting, Scott Fraser’s work keeps him in motion. Scott Fraser shrugs off the word "prodigy," but he displays in his studio a framed watercolor of roses he painted at age three. "I remember painting those roses," said Fraser, based in Longmont, Colorado. Fraser falls into the category of contemporary realists and trompe l'oeil artists, and more than 25 museums across the nation include Fraser's luminous, classical yet quirky still-life paintings in their permanent collections, among them the Metropolitan Museum of Art and the Denver Art Museum. He's part of a prestigious national traveling exhibition titled "Two Centuries of American Still-Life Painting: The Frank and Michelle Hevrdejs Collection," which is now on display at the Tacoma Art Museum through January 7, 2018, and will wind up in the collection at the Museum of Fine Arts, Houston, where it began. And Schiffer Publishing, located in Pennsylvania, recently released a no-expense-spared coffee table book titled "Scott Fraser: Selected Works." Nonetheless, the artist ducks the adjective "gifted," too. "I don't think of myself as gifted," said Fraser. Yet, without a doubt, he is. Fraser's mastery of lifelike detail is such that one might be tempted to take a fingernail to a piece of tape on a painting, for example, to see whether the tape is real or rendered in oil. The Gates Family Foundation Curator of Painting and Sculpture at the Denver Art Museum, Timothy Standring has kept an eye on Fraser's paintings for the past 20 years. He also authored an essay in Fraser's book. Fraser’s visual stories include variations on themes. Subject matter ranges from iconic objects such as Hershey kisses and goldfish crackers, rubber ducks, smoke bombs, matchsticks, skulls, butterflies, seashells. But Fraser’s paintings depict a strange world. Sheet music gets folded into paper airplanes. Arrows pierce battered running shoes. Golf tees hold eyeballs. Dead frogs are served on saltines. Bandaids mend pears. A watermelon wears a pineapple crown. And citrus fruits dangle spiraling peels. “They’re visual rebuses, puzzling. You wonder, ‘What mind came up with this?’ But even though his story is a riddle difficult to understand completely, he doesn’t make it ambiguous. The poetry he’s communicating is quite clear,” Standring said. "He's not a surrealist and not a realist. He's Scott Fraser." "Everything rests on drawing skill. Without it, my work wouldn't come off as well," said Fraser, who executes numerous sketches before each painting. Fraser currently is selecting paintings for Raven Gallery in Aspen. He's setting aside works for an autumn exhibit 2018 at Jenkins Johnson Gallery in San Francisco, which has represented him for more than 20 years. "I work way out," Fraser said, referring to his schedule. Fraser has honed his talent for 40 years, driven by subject matter and composition. At the time of the interview, Fraser was working on a commission. 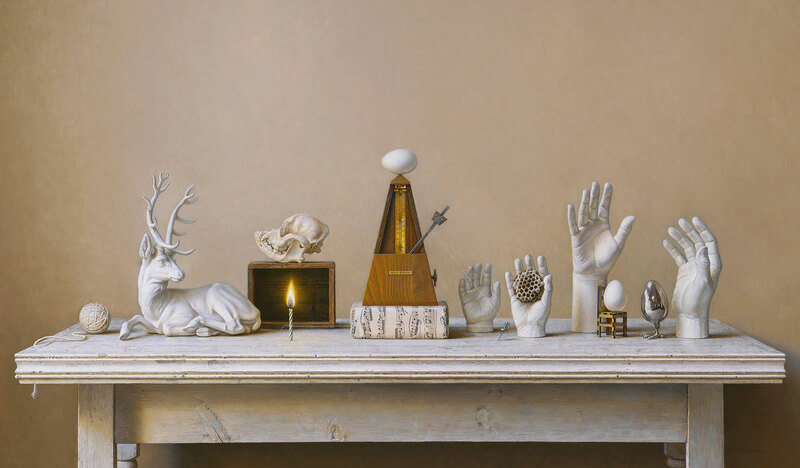 A longtime collector approached Fraser and Daniel Sprick—Fraser's friend and painting peer—to create still-lifes with wine, chocolate, and a famous landscape. Sprick said of Fraser, "We have shared information and points-of-view for about 35 years now, agreeing and disagreeing vigorously, staunch allies with shared goals on separate paths. For each of us, genuine development is a lifetime work-in-progress. His new book is a stunning testimony to his relentless pursuit of quality and commitment to a singular vision." One of the book's distinguishing visual features is full-page photographs of painting details. "That's something that is appealing to other artists," said Fraser, who began working on the book five years ago. "The details in the book reveal a lot of paint build-up. I'm an opacity painter, so I start with the paint thick, then knock it down. There's a tooth to the paintings, a texture, and decision-making in the marks I make. As a painter that's what I like to see," said Fraser. "His attention to detail sets him apart," said Chris Quidley of Quidley and Company. Quidley has represented Fraser since 2013 at his galleries along the eastern seaboard: Boston, Nantucket, Westport, CT and Naples, FL. "I'm always completely blown away and enamored with every single piece we get. There's a satirical, sophisticated humor, not simple or obvious, said Quidley. "Scott uses all kinds of mathematical principles and traditional concepts, but he approaches his work with a modern flair." The new book chronicles the progression of Fraser's oeuvre. He launched his career painting landscapes, then portraits and animals. "I like still-life because I like painting in a studio," Fraser said. "I don't like painting outside. Nor did landscapes offer the narrative option that still-lifes have. I work from life, but I'm always getting away from something that looks like it exists. There's a surreal element." Fraser varies the size of his works. "Making 'Reign,'" the 82" x 76" painting featured on the cover of his book was eight months in creation. When engaged with large canvases, he intersperses smaller paintings — oftentimes 12" x 16". Like the Old Masters, he also paints miniatures on copper as small as 3"x 4". "They're very small and intricate, so I use a magnifying glass on my subject matter and a magnifying glass over the painting, work, and back and forth between the two," said Fraser. For Fraser, an enormous early influence was the Art Institute of Chicago, near his hometown. He frequented the museum with his parents once they realized his aptitude for painting. He said, "Seurat's 'A Sunday on La Grande Jatte' with its millions of dots, the Picassos and Homers, the modern art: all amazed me." Now Fraser amazes others with his mastery, yet holds on to humility as surely as he holds a paintbrush. "When people ask me what I do and 'painter' comes up, they assume I'm a house painter; and I often leave it at that," he said. "Or I might direct them to my website, so if I run into them again it might open a dialogue." Fraser built his spacious studio 22 years ago on the back end of the home where he lives with his wife, Bronwyn, and their West Highland White Terrier, Petunia. Painterly light pours in from skylights and a bank of windows. "It's hard to heat," Fraser said, "I have to wear extra clothes in winter." The artist also drapes a heating pad over his neck to relieve shoulder tension while working. Since the couple's kids went away to college, Fraser often works six days a week rather than five. He said, "Maybe the hours are not as long because I allow time to exercise or get coffee or take my dog for a walk." Nonetheless, he's his own taskmaster. A typical day finds him working 9:30 a.m. until 6 p.m. He said, "I love what I do, so time just flies." he said.